Sheffield’s Stefan Wilson has become the third British driver to be confirmed for the 2010 Indy Lights season after signing with the team set up by IndyCar veteran Bryan Herta. Wilson, whose elder brother Justin yesterday signed with IndyCar team Dreyer & Reinbold, competed in six races on street and road courses last season for FIRST Motorsports and for Walker Racing with a best finish of fourth in Toronto. The 20-year-old has now signed a full-season deal with Bryan Herta Autosport, joining Andretti Autosport’s Martin Plowman and Sam Schmidt Motorsports’ Pippa Mann on the grid for this year. Herta, who finished on the podium in the 2005 Indianapolis 500, and race engineer Steve Newey set their team up in time for the 2009 season with help from a technical partnership with Vision Racing. They scored one win with Daniel Herrington and two podiums with Felipe Guimarães. In November Wilson drove a McLaren Formula One car at Silverstone, his prize for winning the McLaren Autosport BRDC Young Driver Award, but his focus clearly remained on North American racing. He based himself in the US, testing for Indy Lights teams, and joined rival Indy Lights competitors in training at the Indianapolis driver’s gym PitFit. He said: “I am so excited to be returning to the Firestone Indy Lights Series, especially with such a competitive outfit as Bryan Herta Autosport. “I was very impressed by the team’s quick rise to the top last year and I’m confident that the team will immediately demonstrate that same pace this season. Wilson ran his first laps with BHA last week at a test in Arizona and was impressed by what he saw: “I was able to get to know the team really quickly, I really liked the environment of the team and the car was already handling great. Wilson managed 13th and 22nd out of the 27 starters in the two St. Petersburg races last season. 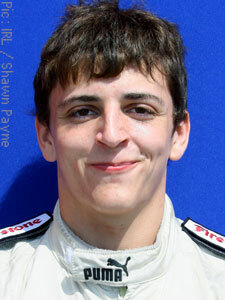 Categorised under Firestone Indy Lights, tagged under Bryan Herta Autosport, Stefan Wilson.